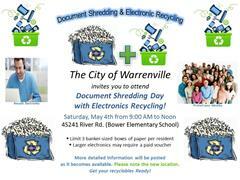 The Police Department is pleased to announce the Annual Document Shredding Day with Electronics Recycling event! This event will be held on Saturday, May 4th in the north parking lot of Bower Elementary School, 4S241 River Road (new event location), from 9 a.m. to 12 noon. This free event is open to all residents of the community, who are encouraged to drop off their paper documents to be shredded. As with past events, this will be limited to three banker-sized boxes. Information on electronic recyclables and a fee schedule for larger electronic items can be found on the Police Department Community Service (Upcoming Police Events and Patrol Initiatives), or by using the link provided below. Questions regarding this event may be directed to Police Deputy Chief Jacobson at 630-393-2131 or jjacobson@warrenville.il.us.